I didn’t think it was possible, but Executive Chef Michael Anthony and his team outdid themselves with this spectacular dinner. Over the last few months Untitled has become one of my favorite spots in Manhattan. Anthony’s cooking pulses with a kind of invigorating freshness that makes it easy to taste 10 or more dishes over the course of an evening and never feel burdened in any way. A week later, Pete Wells at the New York Times awarded Gramercy Tavern, where Anthony is Executive Chef/Partner, a coveted three-star review brimming with praise. I was not at all surprised. Josh Raynolds turned me on to Untitled earlier this year. That night we let the kitchen cook for us. It was a tremendous dinner. I have since been back twice and have yet to order anything. Well, with one exception. 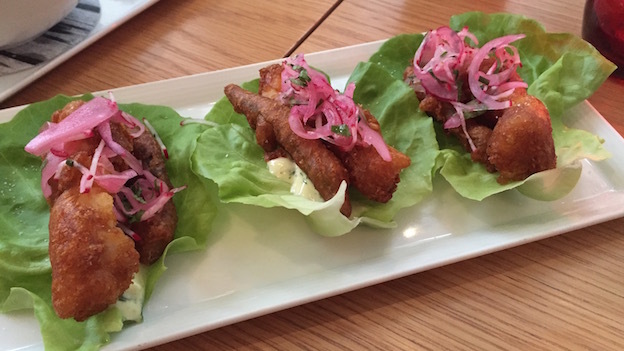 If the fried fish lettuce wraps are on the menu, they are a must. For everything else, I have placed myself in the hands of the kitchen. Each dinner has been better than the last. As is the case at all of Danny Meyer’s restaurants, hospitality is on another level at Untitled. There are no tablecloths and no dress code. All the emphasis is on food and wine. 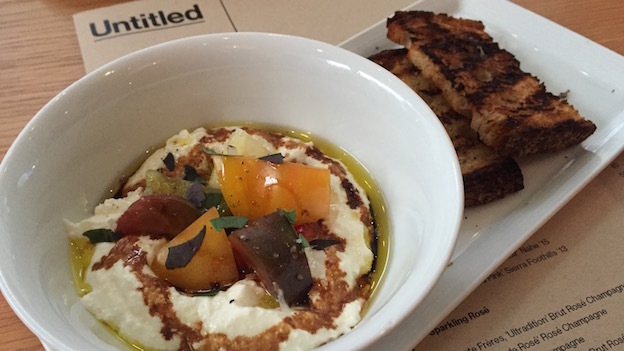 The ricotta with heirloom tomatoes, aged balsamic and grilled bread was an ideal starter on this warm, muggy New York summer night. My favorite dish, the fried fish lettuce wrap, served with okra and radishes, was once again delicious. The only issue with the caraflex cabbage dumplings is that they disappeared too quickly. Bold, lusty flavors dominated the mussels with romesco, fairytale eggplant, another dish that disappeared pretty much as soon as it hit the table. The pole beans, peaches and turnip kimchi dish was a bit more adventurous and eccentric, but it worked. Of the mains, I especially enjoyed the roasted and fried chicken with new potatoes and salsa verde. I rarely, if ever, eat dessert, but I will happily eat whatever comes out of Untitled’s kitchen. 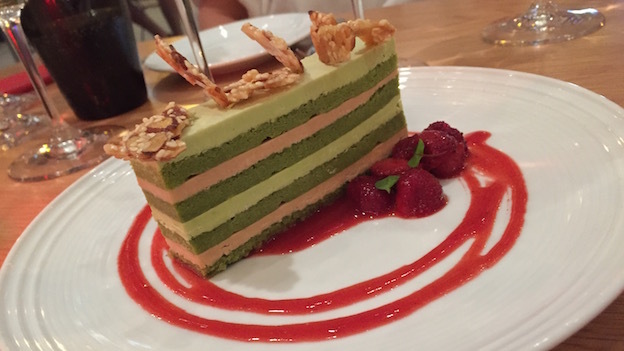 Light and refreshing, the Matcha cake with strawberries and almond sesame brittle was a great way to finish dinner. Beverage Director Eduardo Porto Carreiro has put together a small, but very carefully chosen list with a number of plums. On this night we drank wines from my cellar but on another visit, a few weeks prior, I was thrilled to find Arnot-Roberts’ 2014 Old Vine White Wine Heinstein Vineyard and Tyler’s 2013 Pinot Noir Bien Nacido Vineyard Old-Vine both on the list. The production of both of those wines is just a few barrels, which should give readers a pretty good idea of the kinds of wines that are on the list. I approached both Chablis with some trepidation. After all, drinking older white Burgundies is fraught with risks today. Luckily both of our whites were in terrific shape. 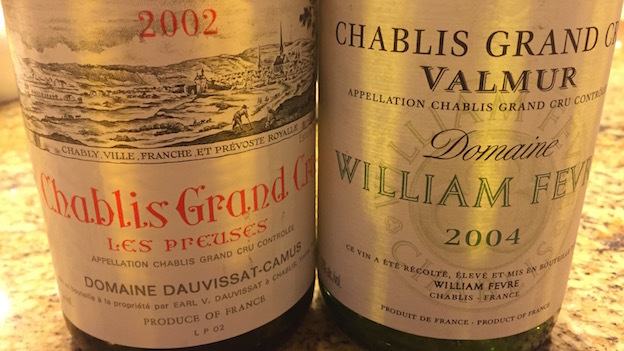 The 2002 Chablis Les Preuses, from Vincent Dauvissat, was everything mature Chablis should be. Gently softened by time in bottle, the 2002 was rich, open-knit and expansive, with plenty of orchard fruit, dried pear, almond, floral-infused honey and chamomile overtones. The power and inherent richness of the vintage was very much in evidence, and yet the wine gained freshness and energy over time. We opened the wine about an hour in advance, but it was at its best after about three hours in the decanter. William Fèvre’s 2004 Chablis Grand Cru Valmur was a much bigger surprise given how many issues the domaine has had with premature oxidation. This bottle was almost shockingly young, with pale green overtones, fresh orchard fruit, herbs and expressive white floral notes. I can only hope my remaining bottles show as well. 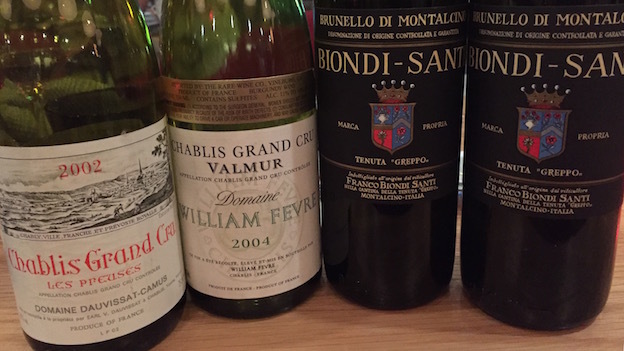 I also brought along two 2004 Biondi-Santi Brunellos to taste side-by-side. In this vintage, the differences between the Annata and the Riserva bottlings are not as many as they can be. Both wines are aromatically intense, focused and built for the long haul. The Riserva has a touch more sweetness, depth and richness through the middle, the result of older vines and vinification in oak. Both Brunellos will benefit from further cellaring, although opening them today is not a crime as long as the wines get a good bit of time in a decanter. Readers who have a chance should not miss an opportunity to dine at Untitled. Michael Anthony and his team are at the top of their game.